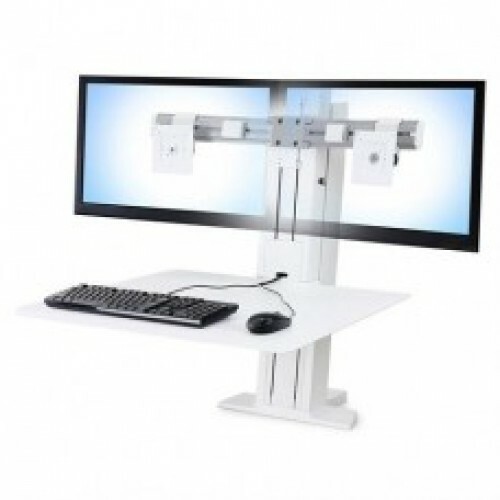 The WorkFit-SR positions a complete workstation within the footprint of your desktop without protruding into your space. It clamps to the rear of most surfaces, converting any tabletop into a healthy sit-stand desk. This is a premium furniture retrofit solution, featuring refined aesthetics and superior material construction. When in the seated position, the thin worksurface always stays close to your desktop. The all-aluminum composition is extremely sturdy, allowing for easy, handle-free height adjustment. 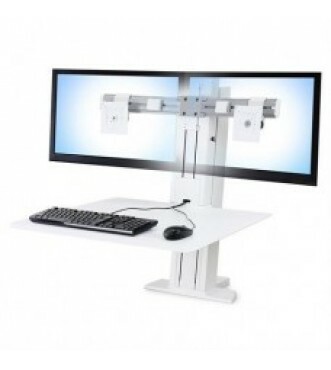 Adjustment Range: LCD and keyboard tray/worksurface adjust 18" in tandem; LCD adjusts 5" independently; LCD height 10" - 37"
Monitor Size: Two Monitors with Maximum LCD outside width: 24.5"
Monitor Height Range: 5" of independent height adjustment, LCD height adjustment: 10" - 37"
Weight Capacity: Maximum Total: 25 lbs., Min: 6 lbs. Monitors: 3 - 11 lbs. each, Worksurface: up to 5 lbs. The Sit-Stand SmartMat is the only anti-fatigue mat they really works for sit and stand desks. It ..